Nicky Morgan’s retreat on total academisation by 2022 is a humiliation. 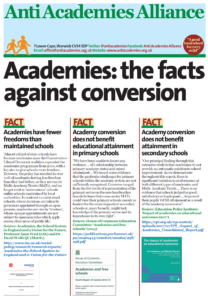 Like Gove before her, she now has to face reality: right wing ideology does not make good education policy. All the rhetoric about choice, markets and autonomy are really just hot air. The market cannot be trusted to deliver high quality education for all. 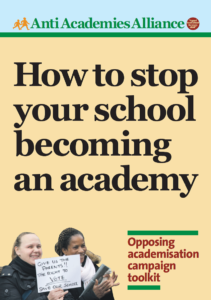 The Conservative government’s announcement that every school will be an academy by 2020 heralds the final episode in the destruction of democratically accountable state education. When Sally Morgan, Labour peer, was ousted as the Chair of Ofsted, she claimed it was a party political move by the current Secretary of State. His current favoured candidate appears to be the multi-millionaire Tory Donor David Ross, Chairman of Carphone Warehouse who leads the David Ross Education Trust. 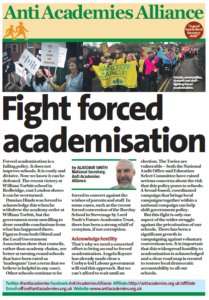 How could he manage the conflict of interest given that his trust runs a chain of 25 academies?